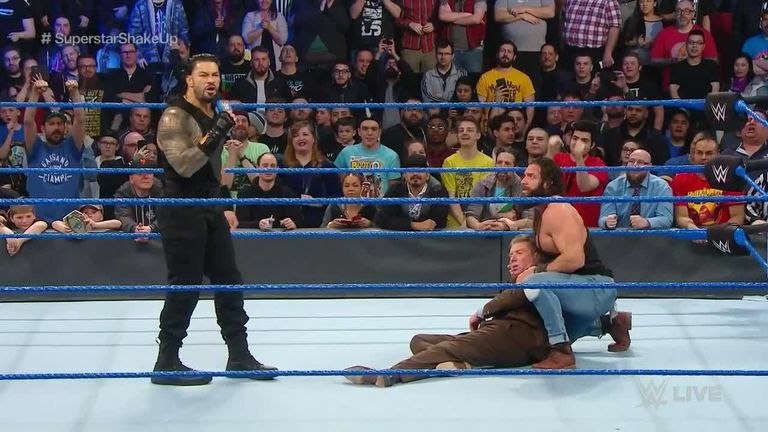 WATCH: Roman Reigns punches Vince McMahon on SmackDown debut! Roman Reigns marked his SmackDown arrival in style - by flooring Vince McMahon with a Superman punch. There had been some speculation that Reigns was heading to the blue brand as part of this week's Superstar Shake-up. And with McMahon promising to bring in the brand's "biggest ever signing", it appeared that the two things would come together on Tuesday night. But, after a brief swerve involving Elias, the two parties did come together - with very painful consequences for the 73-year-old WWE chairman. Vince had plenty to say to Roman, although sadly not of it was caught by the microphone, but the Big Dog lets his actions speak for themselves and did so with a brutal assault of a man 40 years his senior. Will SmackDown bring out an edgier side to Reigns after he was met with a somewhat mixed response on his WrestleMania comeback against Drew McIntyre? Time will tell. Click on the video above to relive this moment and don't forget to catch the repeat of SmackDown on Sky Sports Arena at 10pm tonight.